"You wouldn't swap your cat for a robot"
Book browsers and community-seekers rejoice: this Saturday, April 29, is Independent Bookstore Day. 470 indie bookstores across the country will be participating (find your local party here), and the day will be filled with fun gatherings, great books, exclusive merch (including literary condoms! ), and from what I’m hearing, lots of cupcakes. All of this depending on the whims of your local bookseller, of course. Except for the books—those are non-negotiable, given the circumstances. Emma Straub, whose brand-new indie bookstore Books Are Magic will be opening in Brooklyn May 1st (or perhaps a day earlier, considering) is this year’s Indie Bookstore Day Author Ambassador—I asked her a few questions about achieving every bookworm’s secret dream and what books she’s loving right now. Emily Temple: What are your first bookstore memories? Do you have a favorite bookstore from childhood? Emma Straub: There were several great bookstores on the Upper West Side when I was a kid—there was Endicott, Eeyore’s, Shakespeare and Company. We went to all of them all the time, though in truth, Channel Video, the local video store, was the only place in the neighborhood that had a thing that I could crawl inside, and so that sort of won. Mostly when I think about Endicott, I think about one of the booksellers, who my father was friendly with, who was apparently covering his entire body in tattoos in hopes of becoming a human lampshade someday. Funny what sticks. ET: What has been the best part about starting a bookstore—and what has been the hardest part? ES: The most fun part has been ordering books. That has also been the hardest part. I so badly want the store to have a personality, but I also want to be mindful that my taste is not everyone’s. It’s a tricky thing! We shall see. ET: Why do you think independent bookstores are still thriving in the era of Amazon? What makes them so special? ES: I was thinking about this today, especially in regards to Independent Bookstore Day. What makes indie bookstores so special is that each one is totally unique. Even though we’re all ordering from the same publishers for the most part, each space is totally its own, and each point of view, as well. I could go to a dozen indie bookstores in a day. They are each a total kingdom. That’s why they’re thriving—they’re living, breathing creatures. You wouldn’t swap your cat for a robot, even though the cat sometimes eats your hair and then barfs on the rug. It’s the same thing. I would rather have an eccentric, fallible thing with a soul. Wouldn’t you? ET: Do you have any advice for those who dream of owning their own bookstore one day? ES: Ha! Find a partner (a spouse, a friend, a co-worker) who has different strengths than you do, and who you trust completely. Lose your mind. Jump off the cliff. I don’t know, really! Not yet. Ask me again in a year. 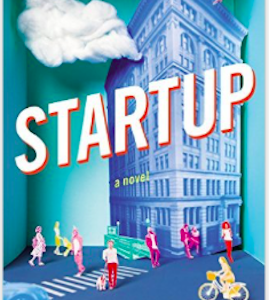 ET: What are you reading right now—and which books should we be sure to pick up this weekend? ES: Right now I am very very very excited about the new Tom Perrotta book, and Eleanor Henderson’s new book, and Pamela Paul’s memoir. I am swimming in galleys! As for you this weekend, well, that depends. What did you read last? What do you love? What are you in the mood for, darling?